One man climbed up to save her. One dog got more than she bargained for when she decided to take a trip far away from the comforts of home. Last week, Hat Trick - called Hattie for short - left her large backyard in Virginia, Minnesota, after she was let out around 9 p.m., and never returned home. 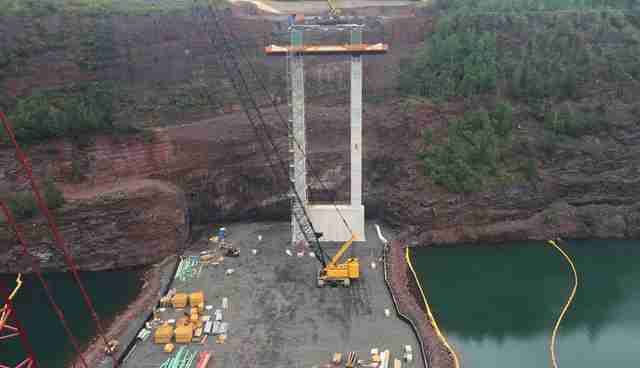 The 12-year-old Nova Scotia duck tolling retriever then wandered right into the thick of a nearby construction site. To her family, it was as though she had disappeared overnight. "Typically ... [her family] let her go out and she comes back without a problem," Judy Jacobs, a public affairs administrator with Minnesota's Department of Transportation (MnDOT), told The Dodo. "They have an invisible fence and she had never broken through the barrier until recently when she went to a local lake for a swim and the night she went to the construction site." While it isn't known when, how or why Hattie scaled the rock wall, somehow she was able to descend down the wall only so far before she became hopelessly stuck. What's even more mind-boggling (or, arguably, impressive), is that Hattie, a senior dog, is on medication for stiff joints, Jacobs said. 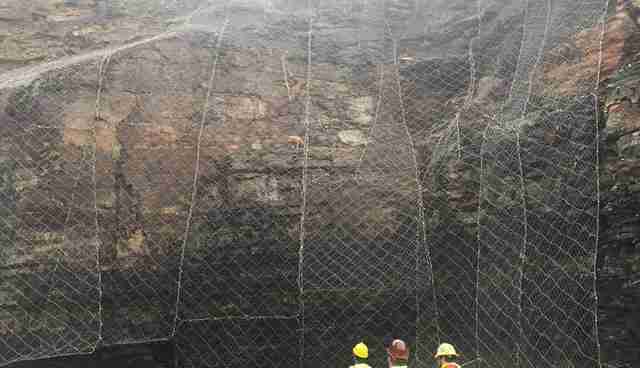 "The contractors were alerted to the dog's presence after hearing rocks falling down the wall," MnDOT wrote on Facebook. 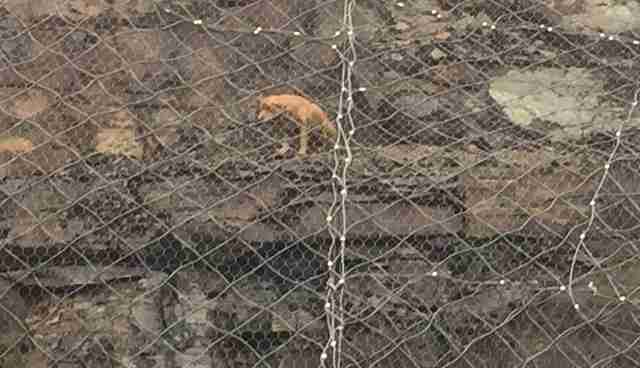 "At first glance they thought she was a fox (the workers had seen multiple foxes climb up and down the wall without issue in the past)." 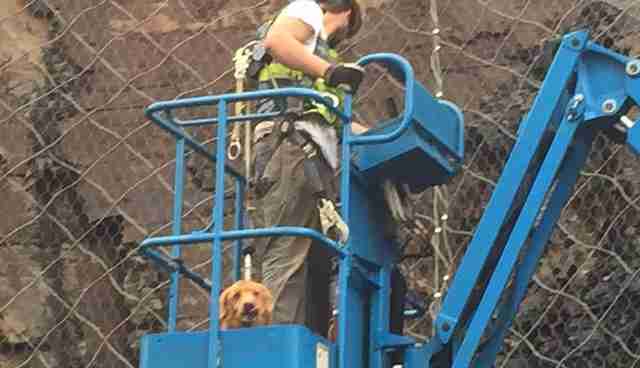 Hattie, frightened by her predicament, did not respond to contractors trying to coax her further down the rock wall, so one worker volunteered to go up to the dog himself. "The pup reportedly jumped right into the basket and was an obedient guest, sitting nicely the whole way down," MnDOT wrote. "The worker even brought an extra safety harness to clip the dog in the basket for extra security." Once Hattie was safely back on the ground, she happily drank from a bowl of water and accepted head pats. Thankfully, she wore a collar with an ID tag. Her owners were called and they arrived within half an hour to take Hattie back home. 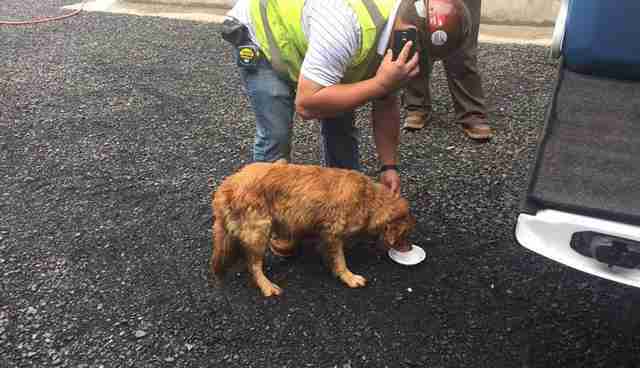 Other than being covered in dirt, the dog was found to be in good health and spirits. "Our family is just so grateful to the workers on the job site who rescued Hattie," Julie Hendrickson, Hattie's owner, said in a statement to The Dodo. "She could have gotten hit by a car; anything could have happened. We're just so glad to have her home safely."